Below is a list of available recorded webinars. To view any of these webinar recordings, please complete the form below. 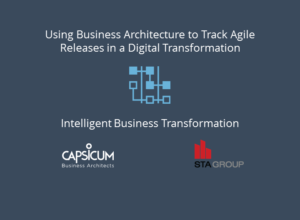 Are you involved in a Digital Transformation effort and facing the challenge of reconciling Agile releases with the future state business model? If so, listen to the recorded webinar that will cover how to identify, track and measure business capability improvements and maturation across a portfolio of Agile projects within a Digital Transformation. The speaker will demonstrate how the Jalapeno semantic modeling platform can provide tangible, reusable project artifacts, and offer an invaluable template to guide business architects and agile practitioners as they lead their companies through the digital transformation journey.